The AWC Lab presents a collection of objects and site-specific activations that call for your participation. The Iyapo Repository is a library that exists in a nondescript future with a collection of art and artifacts, and together with local artists they are expanding the methods we can use to uncover these artifacts. Some artifacts have already been found and will be on display, while the rest will need your help to reveal them. Daily workshops are lead in collaboration with educators/artists from TechShop Pittsburgh, BoXZY, Assemble, PearlArts and the Institute for Plant Motivation. Findings from Phase 1 will inform the next phase of activities and a 2017-18 culminating exhibition. Unlike “traditional” Dead Drops which are blank USB keys, in this library has been seeded with selections from artist archival projects for an off-line peer-to-peer file sharing network. 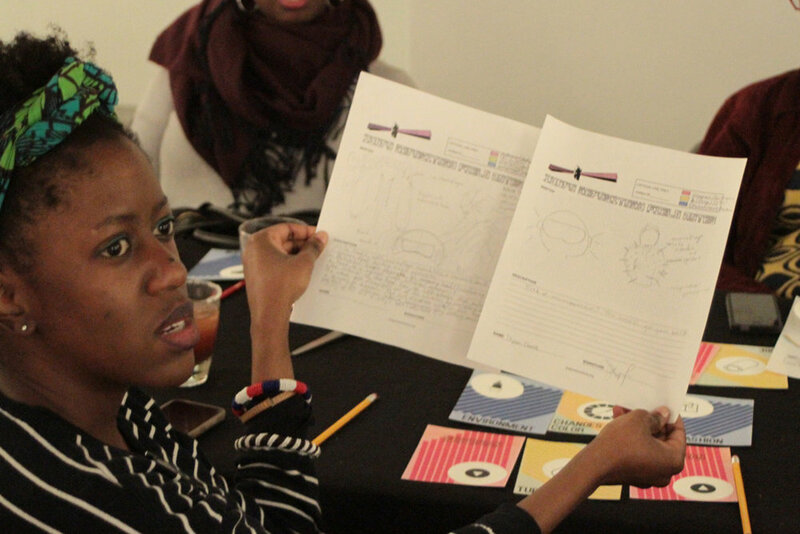 See objects that communities from NYC and others have created with the Iyapo Repository, and design future objects with Iyapo and collaborators in the lab's daily workshops. You can make daily contributions to the lab by using the Archivists' Field Notes to submit notes, drawings, and designs for future artifacts. Open the space each day with a 30-minute Intention Setting lead by Joy KMT and Michael David Battle of Sanctuary. A new selection of films will be on view in the lab, as well as an afternoon Screening Program at the Harris Theater co-curated by Afronaut(a) on Sunday, June 4. Activate shrines around the August Wilson Center at 12, 2:30, and 6:30pm with characters from Boom Concepts' "If I Die I'm a Legend"